If You’re a fan of, Narcos then you might want to check out these other movies from the director and star. The Narcos director first released Bus 174, a documentary which was put together with real footage of a hostage situation somewhere in Rio De Janeiro. Padilha showed us much more than the footage, he told us about the tragic life of the street kid who was responsible for hijacking the bus. A kid who was fucked from the get-go and was led into an inevitable life of crime and drug addiction. A great film, although unbelievably tragic and sad (a feature-length movie was also released from the writer of City Of God). In 2007 he released his first feature film, the brilliant, Elite Squad. A film which dealt with Rio’s special forces called, B.O.P.E. A special trained unit who try to tackle the crime and murder in Rio’s slums. Very much like City Of God only told from a different perspective, full of drugs, murder, and corruption. He then released the sequel to Elite Squad in 2010 called Elite Squad: The Enemy Within. This was a continuation with one of the characters from the first film (Wagner Moura). He then went on to direct his first English-language feature which was the reboot of Robocop. You can all say what you want about RC but I enjoyed the film. I believe that Padilha had great ideas for the Robocop reboot but it fell victim to the production companies chopping it down and making it kiddie friendly. I thought I would mention his earlier non-English features as I think they play a part in why Narcos works so well. Padilha found his leading man in Wagner Moura (Pablo Escobar). Moura is also the leading man in, Elite Squad and its sequel. Narcos, follows the rise and fall of Colombian drug-lord Pablo Escobar and other members of the Medellín Cartel. The American DEA agent, and his partner who are assigned to help the Columbian authorities. 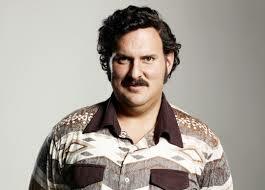 Although the likeness to Pablo Escobar is not really there, Moura’s performance is just astonishing. Escobar is a man that everyone feared, and for very good reason. Moura plays him to perfection. For those of you who have watched the series and would like to find out what happens next. You can check out a Columbian TV series from 2012 called, Escobar, El Patron Del Mal, which is also on Netflix.